Located in southwestern South Dakota in the United States, Badlands National Park is a 240,000-acre park operated by the National Park Service, protecting the largest preserved mixed grass prairie in the country. 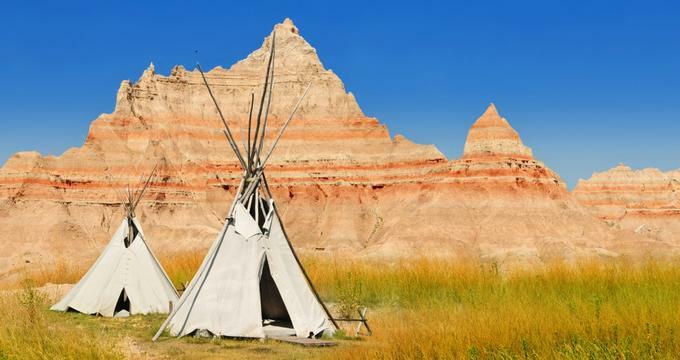 Human occupation of the Badlands area traces back more than 11,000 years, when Paleoindian spear hunters camped out in the area’s secluded valleys in search of big game. Their descendants, the Arikara indigenous people, were the predecessors of the modern-day Lakota tribe, which encompassed seven bands of tribes comprising the Great Sioux Nation at the time of the arrival of European settlers in North America. During the pioneer period of the late 19th century, the United States government displaced indigenous tribes across the country, claiming their land as state territory and relocating them to designated reservations. In 1890, one of the most notable clashes between Plains Native Americans and the United States military occurred in the form of the Wounded Knee Massacre, which killed more than 300 indigenous people under the leadership of Chief Spotted Elk. Throughout the late 19th and early 20th centuries, the Badlands area became a popular site for fossil hunters and homesteaders, although many houses and excavation sites were abandoned during the Great Dust Bowl of the 1930s. The area was designated as Badlands National Monument in January of 1939, although 337 acres of the monument were seized by the United States Army Air Force with the advent of World War II, along with 340,000 acres of land belonging to the Oglala Sioux as part of the Pine Ridge Indian Reservation. In 1978, the Badlands area was permanently protected as a National Park. Today, the park encompasses more than 242,000 acres throughout southwestern South Dakota. Eroded pinnacles, buttes, and spires formed in layers by volcanic ash and river deposits and erosion cover the park’s terrain, which is anchored by the country’s largest extant mixed grass prairie landscape. Many geologic formations within the park trace back around 500,000 years, and are expected to fully erode away within another 500,000, eroding at a rate of one inch per year. More than 400 plant species grow throughout the park, including western wheatgrass, which forms the foundation of the prairie ecosystem. Dozens of mammal, reptile, amphibian, avian, and insect species are found within the park, including bison, pronghorns, wild sheep, and prairie dogs. Reopened in 2006 after major renovations, the Ben Reifel Visitor Center serves as an entrance for the park, featuring a number of interactive and digital exhibits focusing on the natural and cultural history of the Badlands area. The park is split into two major units, a northern Wilderness Area that preserves more than 64,000 acres of open land, and the southern Stronghold Unit, which is co-managed by the Oglala Lakota tribe and the National Park Service. The northern unit may be explored via automobile using the Highway 240 Badlands Loop Road, a two-lane paved road accessible from Interstate 90. Several scenic overlooks are provided, including the White River Valley Overlook, the Big Foot Pass Overlook, and the Conata Basin Overlook. In the north end of the wilderness area, the Sage Creek Rim Road, a gravel natural road, provides access to more overlooks during favorable weather conditions. The Stronghold Unit, located within the lands of the Pine Ridge Indian Reservation, showcases important sites and artifacts from area Native American history, including the sites of 1890s tribal Ghost Dances and the former WWII U.S. Air Force gunnery area, which is still littered with unexploded weaponry today. A number of hiking trails of varying difficulty are offered for visitors, including the beginner Door Trail, which provides a quarter-mile boardwalk, the Fossil Exhibit Trail, which features displays of fossil replicas and information on extinct species that once populated the area, and the advanced-level Notch Trail and Saddle Pass, which provide views of the White River Valley. Two campgrounds, the Cedar Pass Campground, located near the visitor center, and the Sage Creek Campground, are provided for overnight stay. Backcountry camping is also permitted in both units, and the Cedar Pass Lodge, operated by Forever Resorts, is located within the park’s grounds for visitors seeking indoor lodging. Bicycle paths are provided along the park’s major roads and trails, including Badlands Loop Road. A night sky observation program is offered on weekend evenings throughout the summer months, offering a lecture series presented by park rangers. Participants may use telescopes provided by the Badlands Natural History Association to view astronomical objects under the guidance of park staff. The Badlands Astronomy Festival, a three-day event with workshops by astronomy experts, is presented by the park every June.